"The wonderful thing about Tiggers is Tiggers are wonderful things. Their tops are made out of rubber. Their bottoms are made out of springs! They're bouncy, trouncy, flouncy, pouncy, fun, fun, fun, fun, fun! But the most wonderful thing about Tiggers is... I'm the only one!" Is the tune stuck in your head? I can hear Tigger's voice as I type this. If it's not stuck in your head yet, you can always listen to the Tigger anthem on Youtube! 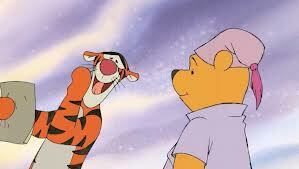 But as happy as the song sounds, and as unfailingly happy as Tigger seems to be, he's struggling with some questions. Why is he the only one? Where are the other Tiggers? In this short, fun, 2000 Disney film, Tigger sets out to find out. Tigger sadly walks away. 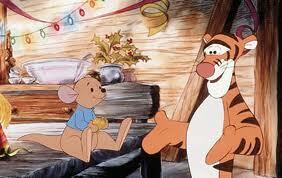 Roo, a young kangaroo, tries to cheer Tigger up by suggesting that Tigger do something he enjoys. Tigger scoffs at the idea. Roo then suggests that Tigger should seek out other Tiggers, saying “I’ve got a momma. Don’t you have a family somewhere, too?” Tigger is inspired by this idea, and begins hunting for his family. He searches through the woods, but does not find them and decides instead to write a letter. Tigger’s friends receive the letter by chance, and write a letter that purports to be from his family. Upon receiving the letter, Tigger becomes convinced that his family will visit him personally. His friends visit his home, dressed as Tiggers, but Tigger soon realizes that they are not actually Tiggers. He walks away offended into a blizzard to seek out his family. 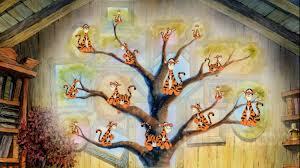 Tigger’s friends go out into the blizzard to find him, and he eventually realizes that his friends are his family. The movie ends when Tigger proclaims Roo to be his little brother and poses for a family portrait with the rest of his friends. 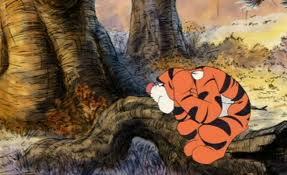 The adoption issues of loss and identity are prevalent in The Tigger Movie. Tigger has often sung that the “most wonderful thing about Tiggers is I’m the only one.” Now he realizes a sadder side of being “the only one.” Owl suggests that Tigger can find his family by first finding his family tree. 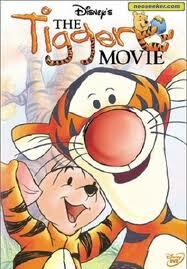 Tigger shows a range of, fantasies, expectations, and fears when he starts pursuing his family. He expects his family tree to be a literal tree. He dreams about being surrounded by people (well, tigers) who look and act like him. He expects that his family will show up unannounced, and when they do not come, Tigger worries that they have been caught in a dangerous storm. Tigger never finds other Tiggers. Thankfully, he does not renounce his efforts to find other Tiggers, but he does accept his friends as his family. Adoptees also may have similar fantasies, fears, worries, and hopes about their birth families, and can be disappointed when their expectations do not flesh out. A heart-shaped locket is prominent in the movie. Tigger finds it, imagines that he’s had it his whole life, expects that it will have a photograph of his family, and then is heartbroken to realize that it is empty. At one point, he expresses his sad belief that the locket (and his knowledge of his family) will “stay empty forever.” Adoptees may feel that their hearts will “stay empty forever,” or that they do not deserve love. 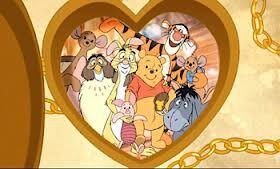 Later, Tigger puts a photograph of his friends in the locket and entrusts the locket to Roo. Tigger has good friends. They were misguided and overzealous in their efforts to help him feel better, but they do love him, and several of them helped him in his search for family before deciding to deceive him. They do not try to correct him when he expresses his honest feelings of loneliness. Roo is very supportive of Tigger and looks up to Tigger as a brother. Roo shares a wonderful conversation with his mother, Kanga. Roo explains that he wishes Tigger was part of his family. Kanga responds, “He already is and always will be.” Roo then honestly expresses, “I still wish I could do something to make him feel better.” There’s quite a bit of good in this conversation: Kanga already views Tigger as family. Roo accepts this as well, but also shows his understanding that this does not yet make Tigger feel better. Friends and family of adoptees can model Kanga and Roo – offer unconditional love, acceptance, and inclusion to the adoptee in your life, but do not expect that your offerings will immediately or completely fill the void they are feeling. Instead, giving them permission to grieve and to search shows your love to be more selfless, your acceptance to be more thorough, and your inclusion to be more trustworthy. Tigger’s friends start by trying to help him find his family, but eventually change their goal to helping him feel better. Finally, Tigger accepts his friends as his family, but the question of where the other Tiggers are (or whether there are other Tiggers) is left unresolved. For some adoptees, this will mirror their experience: answers are not always available. For them, Tigger’s story may normalize their experience, and may even be comforting. For other adoptees, answers may be available, and it would be a mistake to deny them access to their birth family just because they also have a “new” family. Tigger’s friends were generally supportive of his desire to find his family. No one expressed feeling threatened. Rabbit thought the search was unnecessary. Adoptees interested in finding their birth family member may experience a range of responses from the people in their life; some adoptive family members may feel rejected at the thought of the adoptee seeking out the birth family, some might be afraid, some might not see the point, some might be accepting, some might be encouraging. In general, Tigger’s friends did very well by supporting him, even though the quest didn’t turn out as Tigger had expected. Imagine, though, if one or two of Tigger’s friends had said “Well, Tigger, you already have us, and so it’s offensive that you’re seeking out other Tiggers.” That friend would be off-base, and would be putting his needs in front of Tigger’s. Tigger’s friends mean well when they try to trick him into believing that he has contact with his birth family. Tigger finds hope in the letter that he believes is from his family, and begins preparing for a visit. Instead of admitting the truth, we learn that none of Tigger’s friends have “had the heart” to tell him, and instead their deception goes deeper. Tigger is very hurt when he realizes that they have lied, and misunderstands their intention as being an insensitive joke. Sometimes, in an effort to make people feel better, we want to promise them good things, but some promises are not within our power to fulfill. It’s important to be supportive of adoptees, but also to not offer them false hope. For example, Tigger’s friends could have helped him continue searching, and could have encouraged him in that search while also including him in other aspects of their lives. This would have honored his feelings and strengthened his friendship with them. By falsely (although unintentionally) suggesting that Tigger would have contact with his family, they set him up for harsh disappointment. This song-filled, animated movie features familiar Disney characters: Winnie the Pooh, Tigger, Piglet, Kanga, Roo, Owl, Eeyore, Rabbit, and Christopher Robin. It will most likely appeal to younger children, perhaps up to age ten. However, the theme of longing for a relationship with birth family members is relevant to older children as well. Older children might be convinced to watch The Tigger Movie as part of a family night, and would likely benefit from it. 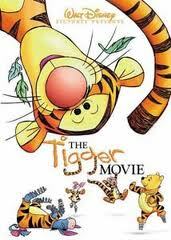 Parents and friends of adoptees watching the movie can consider how Tigger is feeling, and can place themselves in the roles of the other characters in the film: can they see themselves being loving like Kanga, supportive like Roo, well-meaning but misguided like Owl and Pooh, or cranky about the search, like Rabbit? o Tigger imagined a lot about what other Tiggers would be like. What do you imagine your birth family is like? o When Tigger is walking away after the party, how do you think he feels? Why does he feel that way? How do you think his friends feel? Why? o What could Tigger’s friends have done to help him feel better instead of worse? o Even when Tigger felt alone, Roo wanted to be his friend. Who are your good friends? o Owl suggests that Tigger should find his family tree. This is good advice. Grade school (or High School) projects which require students to draw up a family tree or to trace genetic traits through their family can be particularly challenging for adoptees. Now is a great time to start researching and drawing out the tree. Help your adoptee create as detailed of a family tree as you can, incorporating birth family information and adoptive family information. Perhaps this will be your first venture into your own family tree; it could be exciting (and bonding) for your adoptee to go on the venture with you. It’s possible that not much information will be available, but find what you can. The goal is not perfection. Talk with social workers, available birth family members, and former foster parents to gather information. If specific names are not available, perhaps you can research cultures, nationalities, or home states of different family members. o Piglet asks Pooh, “Was looking for a family for Tigger something we were supposed to do?” Pooh responds, “I think it must be… I quite often remember to forget these sorts of things.” Do you find yourself wanting to “remember to forget” conversations about your child’s birth family? If so; why? The emotions that Tigger is portrayed as experiencing certainly match the emotions that I experienced as I began to "wake up" in my adoption perception, noticing a longing and a profound "aloneness" that I hadn't previously been conscious of. The movie was on my mind today so I went searching for information about it. I am stunned to discover that it was made in 2000. I could have sworn I saw it much earlier than that. Thanks so much for your comment - I wonder if the ending of the movie is satisfactory - Tigger accepts his friends as family, but never does get an answer about the other Tiggers. Glad you found this post! That would be awesome. It's Disney, so it'd have a happy ending. I wonder what it would be! Addison, Thanks for such a wonderful "reading" of the Tigger movie. It's all there, the adoption loss, wanting to find one's family, having to find acceptance with what one already has. Thanks for pointing this movie out! This is one of my favorite kid movies and I've always felt it strongly portrays adoption themes. The icing on the cake is the video afterwards of my favorite singer -- Kenny Loggins -- theme song for the movie. Great review!